Entertainers’ Sticking Up for Science: The Help We’ve Been Pleading For? How Do Scientists Make Decisions? This article was originally published in Optics and Photonics News. Have you ever wished you could know what your colleagues think when they look at your website? I have. I know from experience that our peers judge us partly by our presence on the Web. Hiring committees often search online to learn more about job candidates, and review panels use our sites to help decide whether to fund us. So with some help from my friends I did an experiment to learn a bit more about what our colleagues look for in a website. I organize a Facebook group called Marketing for Scientists, where scientists, engineers, and other interested professionals discuss issues related to science communication, science advocacy, and STEM (science, technology, engineering and mathematics) careers. I suggested to the group that we take turns examining each other’s websites and critiquing them. Altogether, 26 people volunteered. They were a mix of faculty and postdocs, with a few science communication professionals thrown in. What impression does the site give about the person who made it? Does the site make you want to find a way to work with him/her? How could the site be improved? At first I was worried that there would be no responses. If you’ve ever organized a meeting or a review panel of scientists, you know how hard it can be to stir our kind into collective action. But then a few eager folks sent in their critiques, initiating a chain reaction. Soon my inbox was flooded, and the constructive criticisms provided a wealth of information and some real surprises. First, I heard a cry for more basic information. Andras Paszternak, a chemist at the Hungarian Academy of Sciences and the founder of The International NanoScience Community social network, suggested that scientists place an email address on their home page. In today’s world of social networking, it’s easy to forget about good old-fashioned email, but this mode of communication is still vital. Next, I heard a broad demand for more images and video. “I would supplement your homepage with more graphical things,” said Robert Vanderbei, chair of the department of Operations Research and Financial Engineering at Princeton. “Please use some color and/or pictures,” said Stella Kafka from the Carnegie Institute of Washington’s department of terrestrial magnetism. Now, many of us recognize the importance of images—but forget the captions. We have photos of things that are important to us but unidentifiable to those who visit our sites! “Nice photo. Is it decoration? Art? Should it have a caption? Are we supposed to guess what it is?” asked Nancy Morrison, professor emerita of astronomy at the University of Toledo. I heard that sentiment several times: Please post descriptive captions that every scientist can understand. So far, you might have the impression that we were merely proofreading each other’s sites. But one element multiple reviewers asked for caught me by surprise. If I could to summarize it in a word, it would be passion. “Maybe the homepage could include your personal motivation,” suggested Phil Yock, a professor in the department of physics at the University of Aukland. “I really like to know what scientists are passionate about, so I’d love to see a short write-up of what fascinates you the most about the universe.” That comment was from Emilie Lorditch, news director and manager at the American Institute of Physics. The other feedback that really touched my heart was expressed well by Yale astronomy professor Debra Fischer. “I was impressed that you offer Powerpoint slides, poster presentations and tools/data from your papers: It’s generous and collaborative and makes me want to follow your example,” she said. Generosity: that’s not a value that was emphasized when I was in graduate school. But science has evolved since then, and in today’s collaborative environment, it seems to be a sought- after trait. 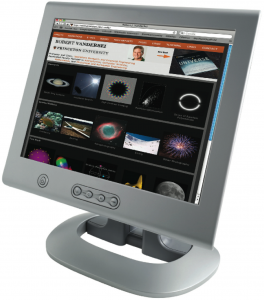 That generous site, by John Debes at the Space Telescope Science Institute, is chock full of free tools and Powerpoint slides that send a warm message of science-y love. 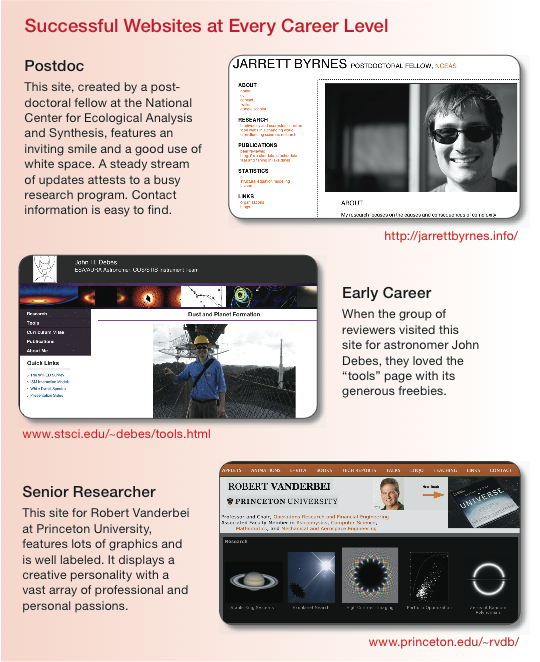 Next time I’m up late tweaking my website, I’ll know just what to post: Full contact information with an email address on the homepage; video and pictures with descriptive captions; a passionate written description of my research; and generous freebies that my colleagues can download. But there’s something else I learned from this experiment. There’s another kind of website that can be a powerful way to interact with our colleagues: It was, after all, a Facebook group that made this experiment possible.